DUBAI -- Dubai is reviving massive real estate projects as its economy recovers from a corporate debt crisis, but this time around, constraints on financing are likely to slow the pace of its building boom. Memories of the crisis will keep many investors cautious about stumping up money before projects are completed. That will leave the plans heavily dependent on bank loans and the bond markets - and the global climate is not favorable for banks. Official announcements over the past few days have recalled the heady days of the mid-2000s, when Dubai was building some of its most flamboyant projects, including the world's tallest skyscraper and an archipelago of man-made islands. Dubai's ruler, Sheikh Mohammed bin Rashid al-Maktoum, unveiled plans last week for Emaar Properties and conglomerate Dubai Holding to build a complex housing 100 hotels and the world's biggest shopping mall. He did not say how much the project would cost but one local property analyst, speaking on condition of anonymity in the absence of fuller details, estimated it would cost between $20 billion and $50 billion. The upper end of that range would be well over half of Dubai's annual economic output. On Monday, Sheikh Mohammed announced that Dubai planned to build a 10 billion dirham ($2.7 billion) complex of five theme parks. Other projects dusted off by the government and property developers in the last few months include a canal to the city's business district and a $1 billion replica of the Taj Mahal. It is by no means certain that all these plans will go ahead. Dubai has a history of cancelled projects: plans for a kilometer-high tower, an underwater hotel and a huge waterfront development were mooted in the boom years and never happened. But unlike projects which ran into trouble during the crisis of 2009-2010, the viability of the new plans will be based to a large degree not on Dubai's volatile real estate market, but on revenues from tourism and retail spending. So if the emirate's tourist boom continues, the projects may pay off. Passenger traffic at Dubai International Airport is growing at an annual rate of well over 10 percent. Nevertheless, in the aftermath of Dubai's crisis, it would be difficult to finance much of the projects by pre-selling parts of them, said Craig Plumb, regional head of research at consultancy Jones Lang LaSalle. "There is natural caution among investors to buy off-plan. There is investor appetite for some small off-plan projects but certainly not at this scale," he said. "So where the money is going to come from for this project is a question that Emaar and Dubai Holding will have to address soon." In contrast to its oil-rich neighbor Abu Dhabi, Dubai's government does not have the large fiscal reserves needed to finance the projects; it was forced to take a last-minute $10 billion bailout from Abu Dhabi at the height of the crisis to avoid a bond default of a state-linked developer. The International Monetary Fund estimates Dubai's government-linked entities will need to repay about $9.4 billion of maturing bonds and syndicated loans in 2013 and $31.0 billion -- much of it loans that were extended during the crisis -- in 2014. It calls refinancing these amounts "a challenge." So Dubai will need to finance its projects from the markets, and the loan markets do not look as attractive as they did in the mid-2000s, when banks were scrambling to lend to the emirate. European banks have been cutting back their foreign lending because of financial pressures in their home countries, while many have been burned by Dubai debt restructurings since 2009. "People have not fully forgotten what happened during the crisis," said one senior Dubai-based banker. Another international banker said he had not heard of any serious financing plan for the shopping mall project so far. "Given the magnitude of the project the government is talking about, we would be in the loop if there was a serious financing plan. This looks very initial and preliminary to me right now," he said. With foreign banks cautious, Dubai will need to turn to its local banks. But they may not be big enough, especially since rules introduced by the central bank this year in response to the crisis limit commercial banks' exposure to state-linked entities. Some banks already exceed the limit. "Local banks are liquid but I can't see them pulling something like this alone," said the first Dubai banker. "Even to finance 50 percent of the project, as it's planned now, will be a challenge for them." That leaves the bond market. Here the climate has improved dramatically this year as investors have regained confidence in Dubai; yields on bonds from the emirate have plunged. In particular, sukuk (Islamic bonds) from Dubai have attracted massive demand, partly because of a huge supply/demand imbalance among cash-rich Islamic funds. So sukuk could play a big role in Dubai's financing activities. However, bond market traders and investors said the Dubai government might not be able to raise more than roughly $3 billion through bond issues in a single year. State-linked companies would probably find it more difficult to issue bonds and have to pay investors higher yields, especially since the Dubai government has been reluctant to provide explicit guarantees for their bonds. The result, analysts said, is that Dubai will probably implement its big projects in phases spread over many years, with the financing of each phase contingent on economic and market conditions at the time. Although Sheikh Mohammed said last week that construction of the shopping mall complex should start "immediately", he did not give a time frame. 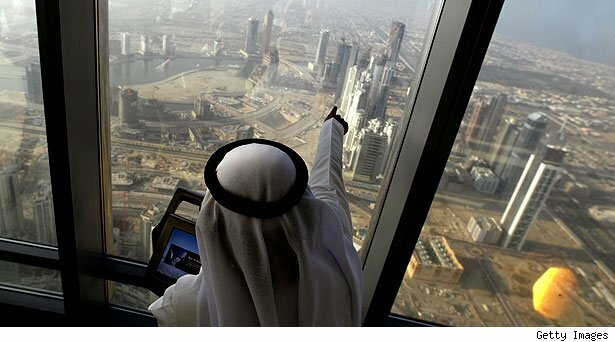 State-backed companies from Abu Dhabi could be invited to join in parts of the projects to improve access to financing. "Abu Dhabi or some of its companies may be part of this mega development," said an Abu Dhabi government official who did not wish to be identified. "It is early days, let's wait for the devil in the details." As one of the seven emirates that make up the oil-rich United Arab Emirates, Dubai has attracted worldwide attention through some mind-boggling, innovative real estate projects. Sit back and peruse our photo gallery of some of the most amazing construction being done in the world today. In the shape of palm trees, these are the three largest man-made islands in the world. The islands are: The Palm Jumeirah, The Palm Jebel Ali and The Palm Deira. The islands were commissioned by Sheikh Mohammed bin Rashid Al Maktoum in order to increase Dubai's tourism. The latest Dubai marvel-to-be is a proposed 68-story combination hotel, apartment and office tower where the floors would rotate 360 degrees. Each story of the tower would be shaped like a doughnut and be attached to a center core housing elevators. Each floor would rotate independently and one single rotation would take around 90 minutes. These 300 islands, positioned to form the shape of a world map, are currently being constructed 4 kilometers offshore from Dubai in Gulf waters. 'The World' is being built primarily using sand dredged from the sea. Prices for the islands will range from $15 million to $45 million. The project is scheduled to be completed by next year. Briefly marketed as "the world's first seven-star hotel," the Burj Al Arab is 1,053 feet high and is the world's tallest hotel. Standing on an artificial island 280 meters from Jumeirah beach, it is connected to the mainland by a private curving bridge. It was built to resemble the sail of a dhow, a type of Arabian vessel. The hotel was completed in 1999. Bringing new meaning to "ocean-view room," the Hydropolis hotel is the world's first underwater luxury resort. It will sit 66 feet below the surface of the Persian Gulf and feature 220 guest suites. 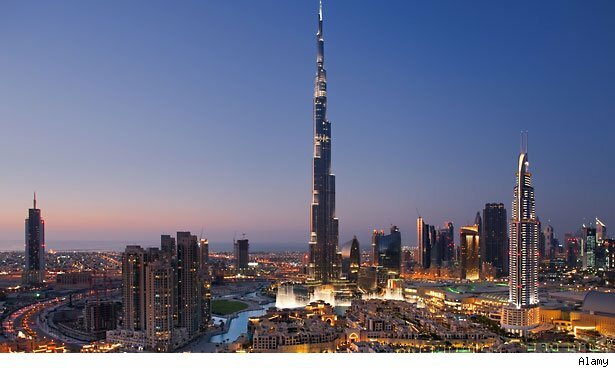 The Burj Khalifa is the tallest building in the world. Located in downtown Dubai, it was completed in 2009. Not to be outdone by neighboring Dubai, the city of Abu Dhabi signed a deal with France this year to build a spinoff of its most famous museum, the Louvre, in the Gulf emirate better known for oil than art. This computer image of the building will be built on a luxury resort island and is scheduled to open around 2012. In preparation for the Dubai Duty Free Men's Open, tennis legend Andre Agassi and Roger Federer, the Swiss tennis professional who's ranked No. 1 in the world, couldn't resist the temptation to have a friendly knock-about on the world's highest tennis court -- the helipad of Burj Al Arab hotel. Ski Dubai is one of the largest indoor ski resorts in the world, with 22,500-square meters of indoor ski area. It is a part of the Mall of the Emirates, which is one of the largest malls in the world. It is approximately 25 stories high and can accommodate 1,500 guests at any one time. The park covers an area of 12 acres and comprises 24 adrenaline-pumping, state-of-the-art rides and slides. Retreat to an oasis in the heart of the city where you will enjoy a breathtaking view of The Creek, the sea-water inlet that is a Dubai hallmark. The 18-hole course has been host to the PGA European Tour Desert Classic. The club prides itself on beautiful fairways and was voted "Best Clubhouse" in Golf World's "Best of the Best" Awards. Marvel Entertainment and United Arab Emirate-based Al Ahli Group are developing a theme park based on Marvel's popular comics: Spider-Man, The Fantastic Four, X-Men, Iron Man, Incredible Hulk and other heroes. The park is scheduled to open in 2011. Consisting of two skyscrapers, the Emirates Office Tower and Emirates Towers Hotel are connected by a 9,000 square meter retail boulevard. The Emirates Towers design draws on earth, sun and moon -- the three Heavenly Bodies of Islam. The sister towers are a symbol of Dubai City. Construction was completed in 2000. Looking around Dubai you would think it is a brand-new city. In fact, it goes back more than 1,000 years. The earliest recorded mention of the city is in 1095 A.D. The Wind Tower is part of the cultural Arabic background of the country that has now been reduced to just 20 percent of the population. The city has many fine mosques. The largest -- and one of the most beautiful -- is Jumeirah Mosque. It is a great example of modern Islamic architecture and is one of the most photographed sites of Dubai. It is particularly attractive at night when subtle lighting throws its artistry into relief. The government's decision to diversify from a trade-based but oil-reliant economy to one that is service- and tourism-oriented has boosted real estate values that have resulted in the current property boom. Construction on a large scale has turned Dubai into one of the fastest growing cities in the world. he WTC has been one of Dubai's premier landmark properties and business locations for more than 20 years. The complex comprises the original 39-story office tower, eight exhibition halls, the Dubai International Convention Centre, a business club and residential apartments with a leisure club. Since 2000, Dubai has initiated a ton of construction phases and plans across the entire city, predominantly in the Mina Seyahi area, located further from Jumeirah, toward Jebel Ali. Many areas of Dubai are dominated by a large number of construction cranes.